I have learned to appreciate the balance between habit and adventure. I need my day to begin with ritual and a very strong cup of coffee. I am always the first one up, quietly padding downstairs, pushing the “on” button of the already prepared coffee maker, the cat greeting me with a muted meow. The pot gurgles and sputters as it finishes brewing. I fill my 16 oz. mug with coffee adding just the right amount of cream and sugar. The cat and I sit on the patio, me watching him do his cat thing while the caffeine does it’s thing. I check my calendar, ready for anything. Traveling I still crave caffeine and routine that first hour of each day. . I wake up before anyone else and initiate my New City Routine. I walk to my destination, usually the Starbucks that’s closest to the hotel. I was a Partner for many years. It has been a long time since I worked there yet the feeling of being “one of them” persists. I remain a faithful customer. On the road, instead of descending my stairs I take the hotel elevator and walk a few blocks, my feet moving to the rhythm of my new surroundings. I begin to match the pace of the commuters on the sidewalk who are already late for work, the artificial urgency of someone who doesn’t really need to be somewhere making me lag behind the others. I step inside the location I’d already picked out and breathe in the familiar smells of espresso and lemon loaf intermingled with the scents of this particular city–perhaps hibiscus in Oahu or the salty air in San Francisco. A new face in a green apron warmly welcomes me, reinforcing the sense that I belong there. Ordering my tall bold coffee, preparing it with one raw sugar and a dollop of half and half I look for the perfect seat near a window and observe this new city that will be home if only for a few days. After finishing my first cup, I get a free refill with my well-deserved loyalty card, return to the rented room where I sip, shower and prepare for the adventures that await me. The second day is always better than the first, perhaps because the same baristas are there and remember me, the shop now commonplace as I sit in the same seat, noting how the city prepares for the upcoming weekend, trucks delivering fresh fish to the restaurant across the street, couples holding hands, a young man in pajamas being pulled by a yappy happy dog. 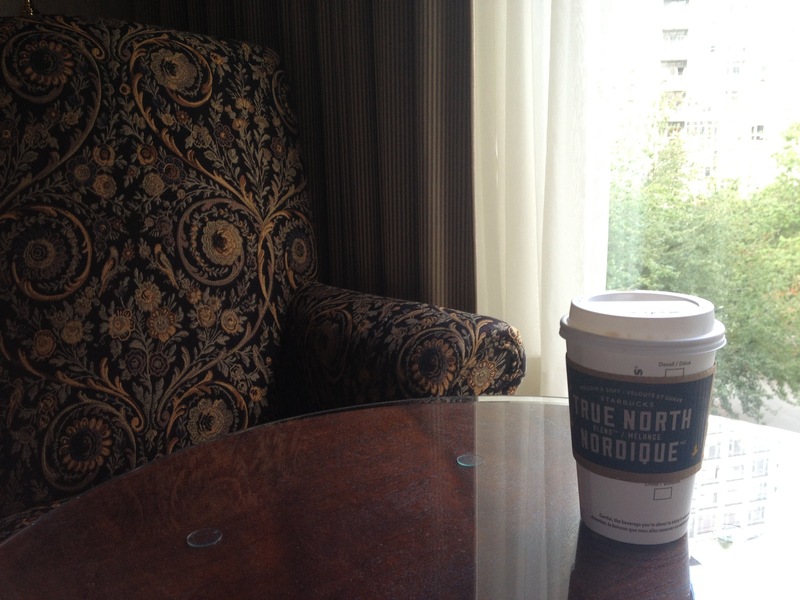 Recently while in Vancouver for three days I went to a Starbucks that was a little farther from my hotel because it had a better vibe than the one next door. A young man greeted me with a welcoming “Good morning”. The next day he asked if I was from out of town and we chatted about my New City Routine, how important he and his co-workers were to me. My third and final morning I waited in line, disappointed my young man wasn’t behind the counter, trying not to take out my displeasure on the girl at the register. The place was packed, Monday morning regulars bustling and jostling me, anxious to be on their way. I tried to use mind games on the man reading the paper in My Chair but he remained stubbornly in place. As I gave up finding anywhere at all to sit, a beaming and smiling face elbowed through the crowd. My nice young man had been in the back room. He saw me through the door and wanted to tell me goodbye, remembering I’d told him I was leaving Vancouver that afternoon, anxious to tell me that he’d shared my New City Routine with his co-workers and that it meant a lot to all of them. He gave me a coupon for a free drink at the airport and waved goodbye as I left. I will probably not see him again, but you never know. I might go back to Vancouver someday and need a cup of coffee and a friend.